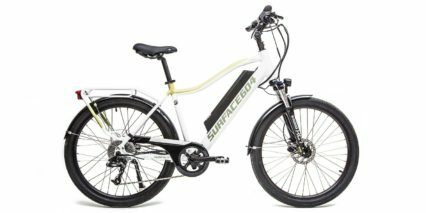 Integrated, Sealed Cartridge, Straight 1-1/8"
Surface 604 is an electric bike company that has been in business since 2013, selling to both the United States and Canada. 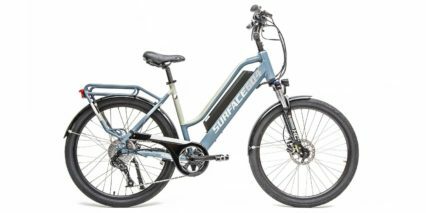 Their products emphasize value pricing but often mix in higher quality components like hydraulic disc brakes, a sealed torque sensing bottom bracket, integrated lights, and a highly adjustable suspension fork in this case. You can find and test ride their bikes at a broad network of dealers and online direct (if you don’t live near a dealer). What I love about the Colt, and it’s step-thru sibling the Rook, is that together, they offer two frame styles and a wide range of fit options as well as two colorways. The Colt is going to be stiffer, sturdier, and a bit easier to hang on some car racks. 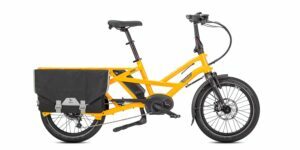 It comes with a highly adjustable stem from Satori and there’s plenty of room to lower the saddle height without colliding with the rear cargo rack. Even with the “high step” tubing, there’s still a lot of clearance for mounting and standing over the bike because it’s sloped down. I measured the standover height on the Large 19″ frame at ~28.75″. 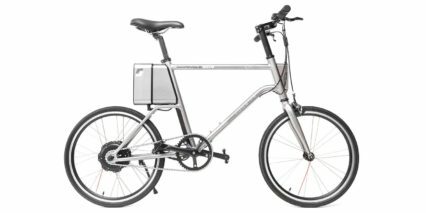 Surface 604 has really nailed the little details on this e-bike by including bottle cage bosses along the base of the downtube (yes, not the most convenient to reach but better than skipping them), and designing a rack with narrow-gauge pannier hangars for use with quick connect clip-on bags like this. Of course, at this price point, not everything is perfect. 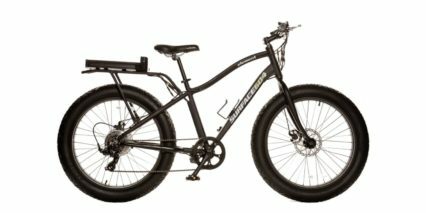 The front fender is a bit close and can zip and jitter when riding over rough terrain, the tires are pretty basic (no puncture protection or reflective sidewalls), and the trigger throttle is limited in power and speed by the level of pedal assist that you choose. Still, for a bike that comes with a comprehensive two-year warranty and rides this well, I feel that it’s a great value… and I like how it looks, the graphics and branding elements are understated and the satin paint hides fingerprints but isn’t obnoxiously glossy. Cables are internally routed through the frame and the motor doesn’t produce much noise for how powerful it is. 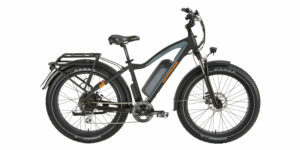 The motor driving this electric bicycle feels smooth and accelerates steadily but still provides great torque and power. I’m not sure on the model number, but it’s made by a company called Bafang. 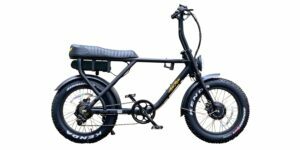 I have seen their products installed on many other electric bikes over the years and come to trust them. 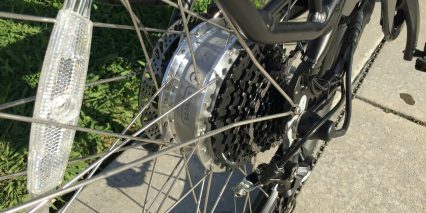 This motor is silver, and matches the thicker 12 gauge spokes that support the rear wheel. The rims are double walled alloy and painted black to blend in with the tires. I’ve already griped about the tires a bit, but they aren’t all that bad… I appreciate the 26″ diameter because this lowers the frame a bit compared to 27.5″ or the most common 28″ city size. Smaller wheels do have a higher attack angle however, which means that they won’t span cracks as efficiently. The fatter 2.1″ diameter adds air volume for comfort and stability. The bike felt stable and tracked nicely, even when I was riding with no hands. 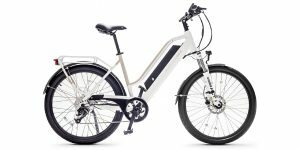 I have been on some cruiser style ebikes that suffered from speed wobble, where the front wheel would shake back and forth at certain speeds. I did not encounter that here, and I feel that the combination of lowered weight and stiffer frame design (with the diamond frame style) provides strength and stiffness. 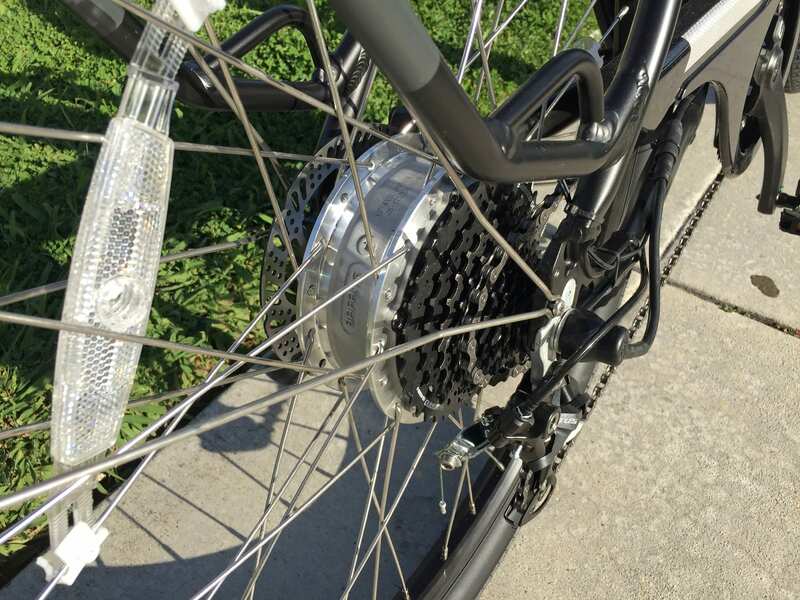 It’s nice to have your pedal power instantly transferred into the drivetrain of a bicycle, and it’s empowering to feel quick steering response, but your body will still be cushioned by the tires, front shock, ergonomic grips, and gel saddle. For those who want even more comfort, Surface 604 sells a nice suspension seat post for $99 with a shim to make it fit the seat tube perfectly. 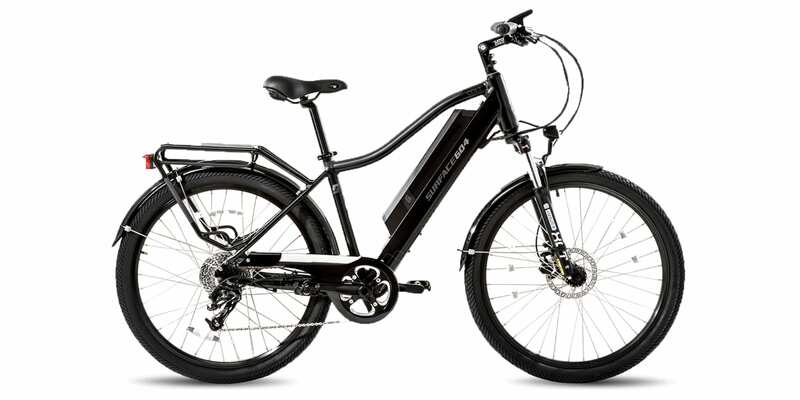 Considering that the motor can propel this ebike up to 20 mph (32 km/h) in the highest level of assist, it’s something I would strongly consider for myself. Shops that sell both regular bikes and e-bikes frequently tell me that the e-bikes get significantly more use and are ridden for longer periods of time… because they are more fun or more practical for commuting. 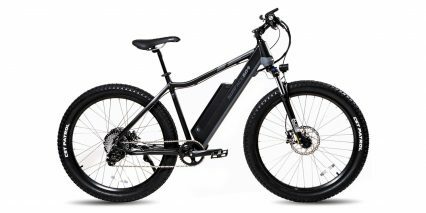 This motor should support upwards of 25 miles per charge, and maybe as high as 60 miles, depending on the level of assist you choose, how much you use the throttle, and how actively you pedal. 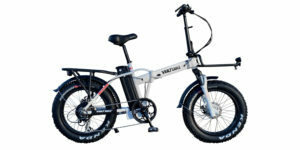 But, because it uses a torque sensing bottom bracket, you are forced to push at least a little bit to get the motor working in pedal assist mode. It’s actually very satisfying, because the bike responds naturally, there’s less surprises. Some of the older Surface 604 models (and many current cheaper models) use cadence sensors that produce an on/off feeling that can be a bit startling if you accidentally move the crank arm for stability. The strain/torque sensing unit is built into a plastic casing that’s fitted onto the left side of the bottom bracket, and it seemed well sealed against water. 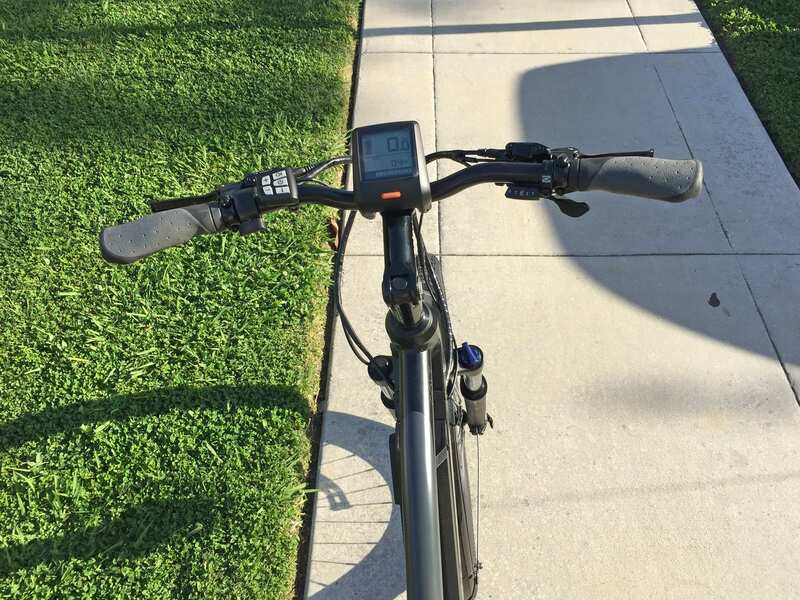 In summary, the motor and pedal assist system worked very well for me on this electric bicycle, I only wish the throttle could go full power without having to click the control pad to raise the level of assist. That said, the default assist level that comes up when the bike is powered on is level 1, so the throttle is live instantly. It’s nice to know that if you do accidentally bump the throttle, the bike won’t be zooming away on you with full power. 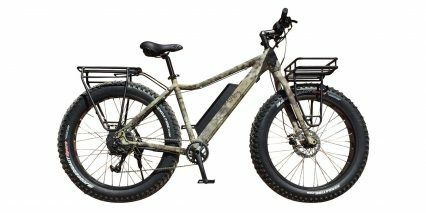 Powering this bike is an above-average capacity 48 volt 10.4 amp hour Lithium-ion battery pack with name brand Samsung cells. It weighs a bit more than average at 7.5 lbs because of the sturdy alloy casing, but I love that it offers a USB charging port on the right hand side. 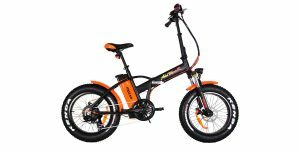 This port can be used whether the battery is mounted to the bike or stored separately, acting as a backup power source. 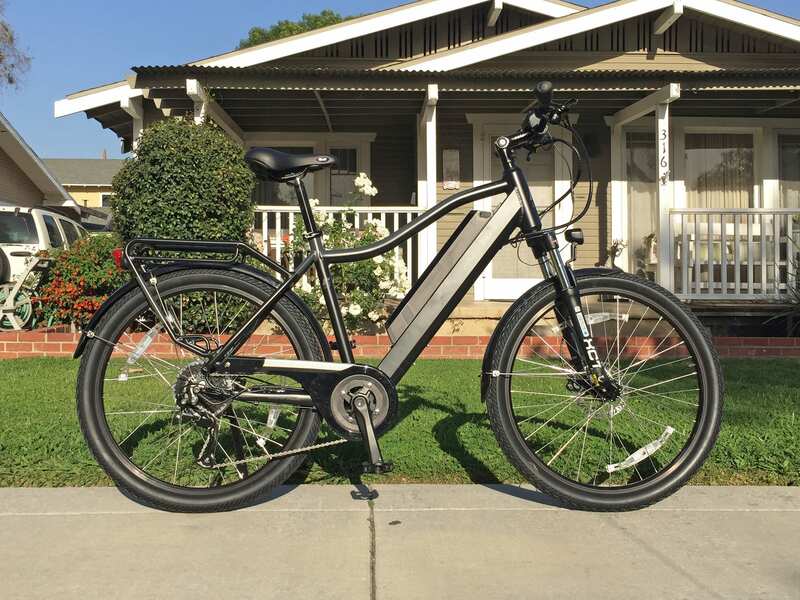 With nearly half a kilowatt hour of electricity on hand, there’s plenty of support for the hub motor, lights, backlit display, and accessories. 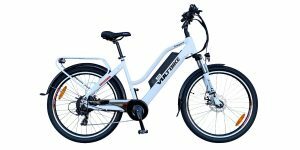 The motor is rated between 500 watts and 750 watts, producing up to 65 Newton meters of torque, which is quiet good for how small and quiet it is. This sort of performance uses energy faster however, so it comes back to which level of assist you choose, how often you use the throttle, and the torque sensor setup. For me, it’s just nice to know that this thing can climb pretty well (I experienced this with some of the grassy hills on a golf course I rode through for the video review of the Rook above). 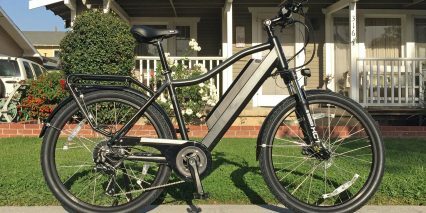 Some ebikes feel zippy, and others feel subtle and sort of build power. This one offered a good mix of both sensations, and I attribute it to the torque sensor and more powerful drive system. 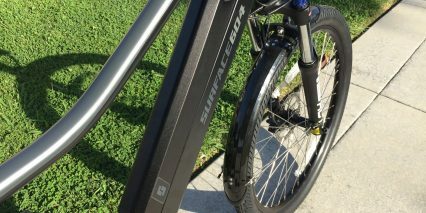 The battery pack seats into the frame dock from the left side of the bike and comes in at an angle. 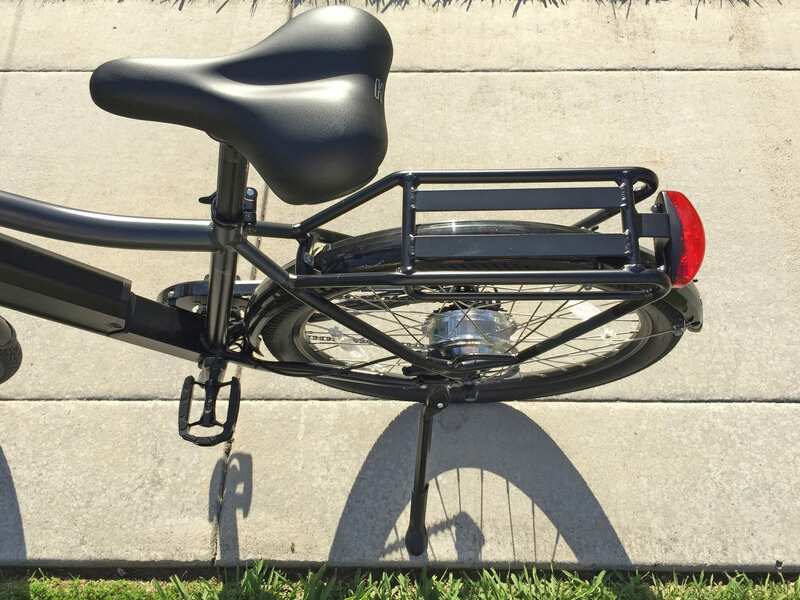 This allows space in the main triangle for mounting a frame bag or water bottle adapter. The frame tubing protects the pack from kicks and scratches, but the alloy casing seemed pretty tough all on its own. 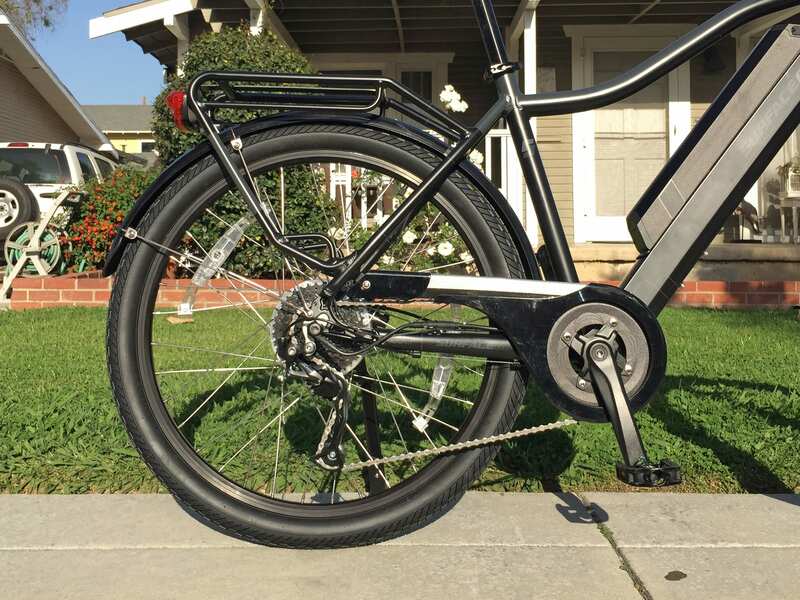 There’s a spring-loaded key slot on the left side of the downtube, which unlocks the battery. And, you pull a lever to release and lift it up. I like having the lever because it provides more secure lifting and carrying. High capacity battery packs like this are expensive and can be damaged if dropped or left in extreme hot or cold temperatures. I have read that the cells are least stressed when filled between 20% and 80% and the display panel has a better than average 10-bar charge level infographic to help you estimate your range and time the next charge. 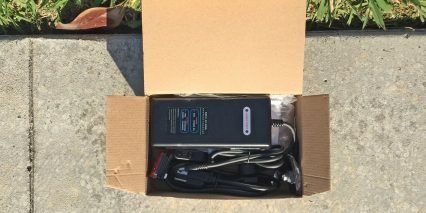 The charger itself is pretty basic, just a standard, lightweight, two-amp charger. You could easily fit it into a trunk bag and bring it with you for quick fill-ups at the office or a friend’s house. I like the display that was chosen for this bike, even though it’s not removable. 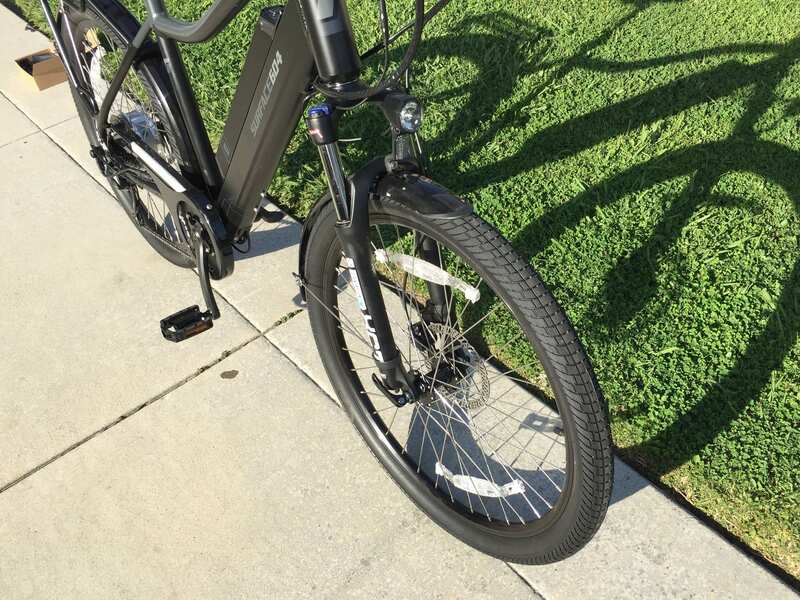 It just seems solid and tough… I recently saw the plastic hinge on a much fancier $4,800 ebike display crack and break during careful routine service, and quickly came to appreciate how some brackets can swivel and be removed without weakening. We fixed that display by using zip ties :) Anyway, the display that comes with the Rook and Colt does swivel easily (to reduce glare while riding), has a very large inset LCD that is easy to read at a distance, and has an intuitive and reachable button pad to interact with. This display isn’t trying to hide, it just works well. The top left section has a 10-bar battery indicator, there’s a speed readout near the top right, your current level of assist (0-5) is shown at the very bottom, and a bunch of trip stat menus like trip distance, odometer, max speed, etc. are listed in the middle. The bike starts in assist level 1 but you can use the minus key to go down to zero and pedal without assist or throttle active. This mode is useful for keeping track of ride stats and running the lights. The lights are pretty neat, in my opinion, because they will activate automatically based on how dark it is outside, or you can manually switch them on by holding the light icon on the button pad. The plus button raises assist, holding the power button turns the display on and off, and the i button cycles through stats or enters the settings menu if you tap it quickly two times. 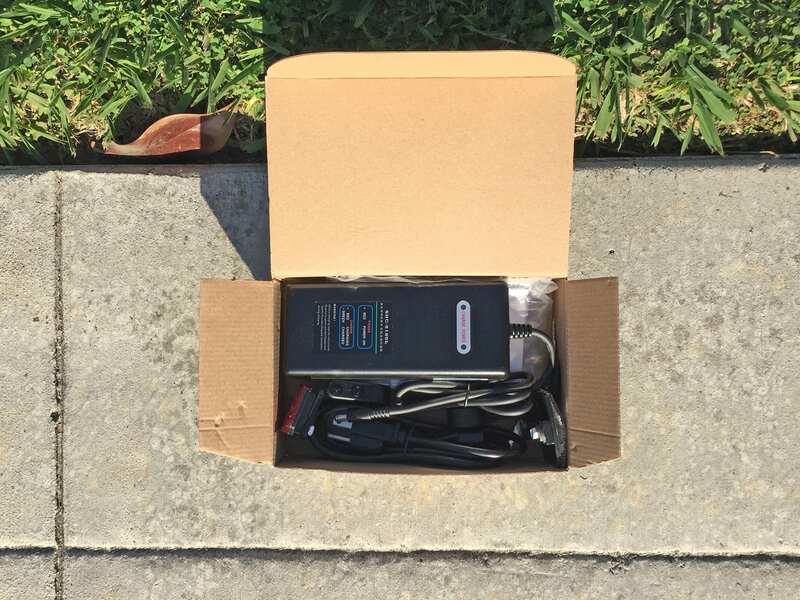 From here, there are several options including: Data Reset, Units (Metric or Imperial), Light Sensitivity (for the headlight and backlight), LCD Backlight Brightness, Automatic Off Timer, Maintenance Warning Settings, Password, Wheel Diameter Settings, and Top Speed Adjustment. I don’t think you can adjust the wheel diameter or top speed adjustment without the password, and that requires contacting the company. 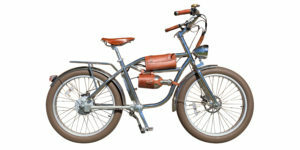 Some of the older Rook and Colt models could reach higher top speeds, but that’s technically illegal for many bike paths and it wears the motor out faster. Many shops have told me that customers often want to ride slower than 20 mph, and you can achieve this by limiting which level of assist you select: Level 1 is ~6 mph, 2 ~9 mph, 3 ~14 mph, 4 ~17 mph, and Level 5 is ~20 mph. I just appreciate that there is only one power button to press in order to activate the display panel… that it seems tough and water resistant, and that you don’t have to memorize fancy button combinations to get things working. More buttons makes it simple and intuitive. The one secret you might be interested in however, is that holding the minus key will activate walk mode. 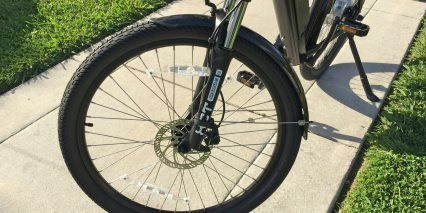 This allows the bike to help you move through grass, up ramps, or limp home in the event of a flat tire. Do keep an eye on the tire pressure though, because it’s easier to get a pinch flat if you allow it to drop below the recommended 40 to 65 PSI and run into a sharp curb or rock. There’s a lot to explore with this product, I appreciate the decisions that were made to keep it affordable but not cheapen the parts and performance too much. 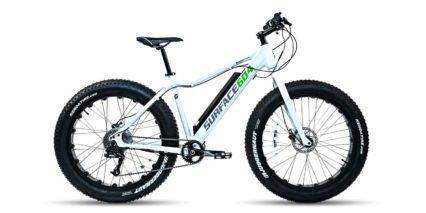 Surface 604 is based in Vancouver Canada, where it rains, and it seems like they have made sure that the bike will stand up to wet conditions. 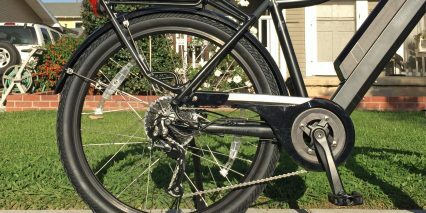 The 9-speed cassette gives you lots of pedal speed options, and the Shimano Altus derailleur is a step up from entry-level. It looks pretty nice, is positioned out of the way (tucked under the right chain stay), and uses faster trigger shifters vs. the big thumb shifters on many other products. 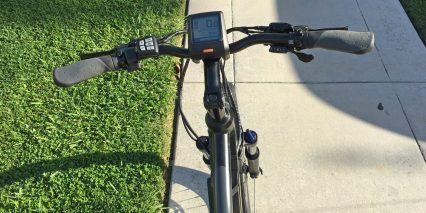 The cockpit on this ebike is fairly clean, even with the big display, trigger throttle (which is easy to reach and offers variable speed output depending on how far you press), and ebike specific hydraulic disc brake levers. Whenever you brake, the motor instantly shuts off. It’s a great feature, and one that is often skipped when torque sensing assist is implemented… because it’s already so much more responsive than cadence sensing. Yes, the grips are pretty cheap, they don’t lock on and could spin if you really bear down. Thankfully, they are fairly comfortable and could be upgraded significantly for just $20. 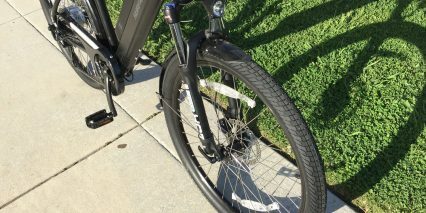 While exploring the bike closely, I noticed what appears to be a stainless steel insert at the rear dropout to protect the softer alloy frame from motor power being exerted through the axle. I also saw how they organized the power cable for the motor (which is a bit exposed) so that it’s not interfering with the derailleur cable or rear light power cable. Be careful not to let the bike tip onto the right side, because this is where the fancier bits are. 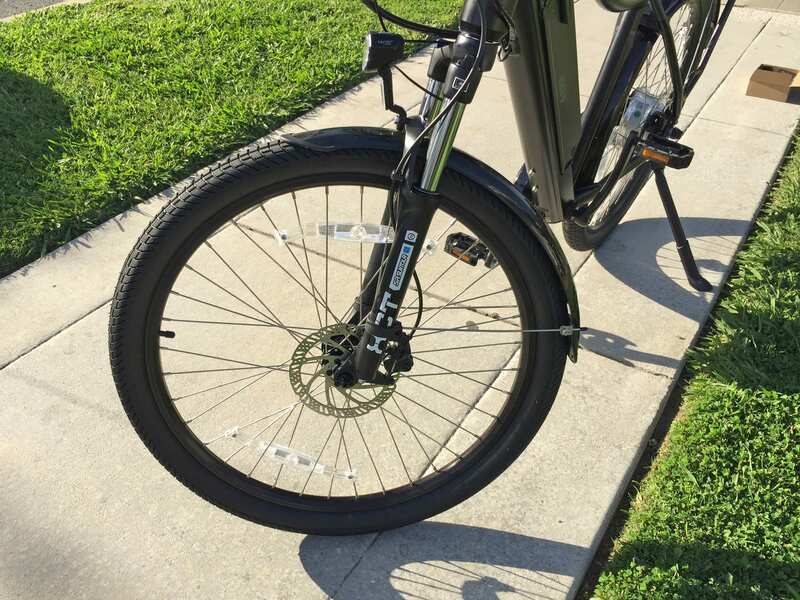 The front wheel and seat post collar are quick release, which makes adjustment and servicing easier but also makes them vulnerable to theft and tampering. 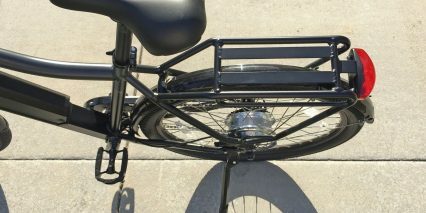 Consider a locking seat leash cable and always loop your front wheel with the frame when locking. Mounting a folding lock to the base of the downtube, where those bottle cage bosses are, could be a good thing. And finally, it seems like the bar that Surface 604 specced for this bike offers a bit of rise but is shorter than some (especially the swept-back cruiser bars). And, my guess is that this allows the bike to fit between cars and through doorways more easily. It all works together well and makes for an enjoyable and empowering ride. 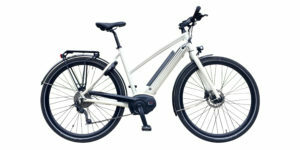 The shorter reach and comfortable design remind me of a cruiser at times, but it offers the utility, efficiency, and durability of a city bike. 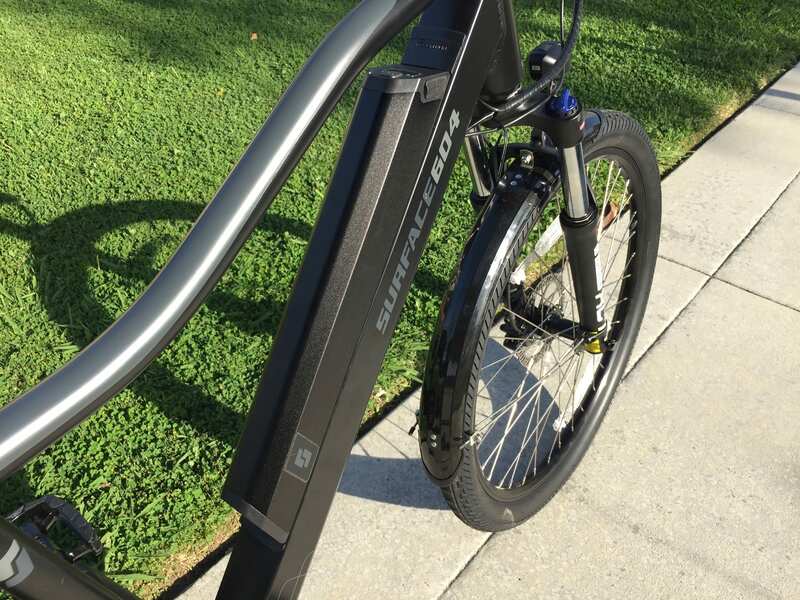 Big thanks to Surface 604 for partnering with me on this post and working with the Electric Bicycle Center in Fullerton California for the review. I was impressed by the free shipping and quality packaging on the Rook (when Surface 604 shipped that model directly to me for review). It gave me the full “online order” experience, which is neat to see and hopefully helps relate to actual customers. I welcome your feedback in the comment section below and the Surface 604 forums. Great attention to detail here, they used a nicer Satori adjustable stem, upgraded Wellgo pedals, and even included bottle cage bosses on the base of the downtube! Does anyone know if this is a controller that can be overridden for higher top speed, like the Rad bikes? You really do a great job with the reviews, thanks for the info.